In my third year of the Birkbeck BA Creative Writing I did a module on ‘genre’ fiction and I had to write, amongst other pieces, a short piece of historical fiction. I have always loved historical fiction but was not sure that I had the capacity to do the research necessary. But for the purposes of the assignment I thought I would write something about Marie Curie. I read that when her children were young she’d set up, together with some other scientist friends, a sort of school that they called ‘The Cooperative’ to educate their children, including the girls who did not have as many educational opportunities those days. Her educational approach was obviously successful as her daughter went on to be a scientist as well and to win a Nobel prize. 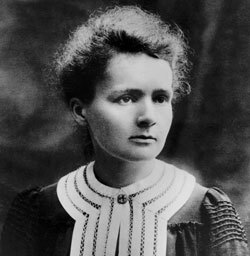 I also read that Marie Curie used to carry samples of radium with her sometimes and even used it as a makeshift nightlight next to her bed. And of course it was this exposure to radiation that eventually killed her – a tragic irony. In my piece I imagined a young boy travelling with his father to meet Madame Curie for the first time and join the school. I entered the piece in the Writers & Artists Historical Fiction Competition and was very pleased to discover that, though I didn’t win, I was one of the three runners up. This has encouraged me to consider developing it into a longer piece. She’s a fascinating character and it would be an exciting time to write about – though I’d have to work on my science knowledge! You can read the piece here on the Writers & Artists website.